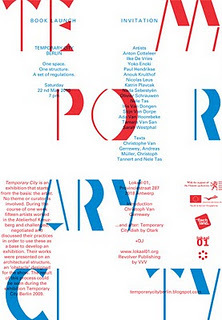 Temporary City was an exhibition that started from the basis: the artist. No theme or curator was involved. During the course of one week fifteen artists worked in the Atelierhof Kreuzberg and challenged, negotiated and discussed their respective practices in order to use these as a base to develop an exhibition. Their works were presented on an architectural structure, an ‘obstacle’ designed for the show by Andreas Müller.